Spanish-Arabic vizier of the middle of the twelfth century mentioned in the "Diwan" (collection of poems) of Moses ibn Ezra, with the title "vezir." This is the only fact known about him, but the importance of the position assigned to him by Ibn Ezra has led to two attempts at identification. According to Steinschneider he is identical with the Abraham ibn Meir to whom Moses dedicated his "Tarshish." (See "Kerem Ḥemed," iv. 29; Grätz, "Gesch. d. Juden," 3d ed., vi. 100; Steinschneider, "Cat. Bodl." col. 1808; "Jew. Quart. Rev." ix. 619.) A poet, Joseph ben Meir ibn Muhajir, is supposed by Steinschneider to have been a brother of Abu Isḥaḳ ("Cat. Bodl." col. 1809). Luzzatto supposed that he was the son of Abu Ibrahim ibn Muhajir, to whom Judah ha-Levi dedicated a poem ("Betulat bat Yehudah," p. 20). 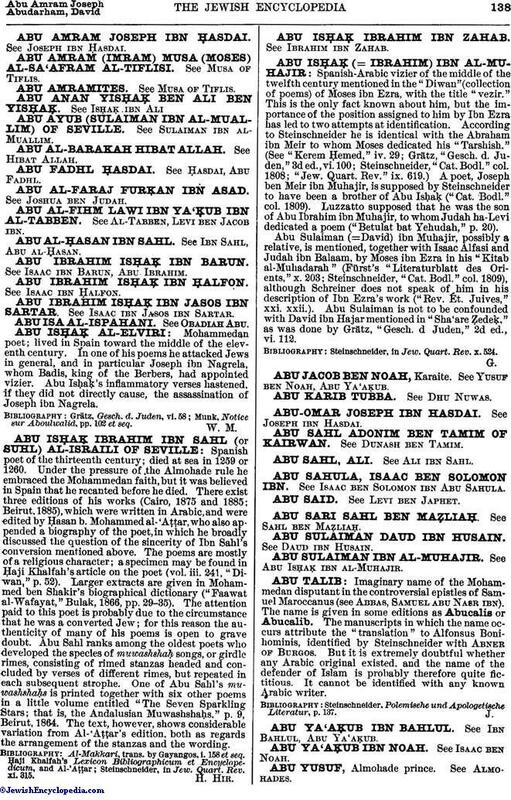 Abu Sulaiman (=David) ibn Muhajir, possibly a relative, is mentioned, together with Isaac Alfasi and Judah ibn Balaam, by Moses ibn Ezra in his "Kitab al-Muhadarah" (Fürst's "Literaturblatt des Orients," x. 203; Steinschneider, "Cat. Bodl." col. 1809), although Schreiner does not speak of him in his description of Ibn Ezra's work ("Rev. Ét. Juives," xxi. xxii.). Abu Sulaiman is not to be confounded with David ibn Hajar mentioned in "Sha'are Ẓedeḳ," as was done by Grätz, "Gesch. d Juden," 2d ed., vi. 112. Steinschneider, in Jew. Quart. Rev. x. 524.